Representative John Conyers, Democrat of Michigan, is facing a growing number of claims of sexual impropriety. Conyers, 88, said Tuesday he’d leave Congress immediately. WASHINGTON — Facing multiple allegations of sexual harassment, Representative John Conyers Jr., a Michigan Democrat, resigned as Congress’s longest-serving member on Tuesday, becoming the first lawmaker to step down as Capitol Hill grapples with allegations of inappropriate behavior by lawmakers. 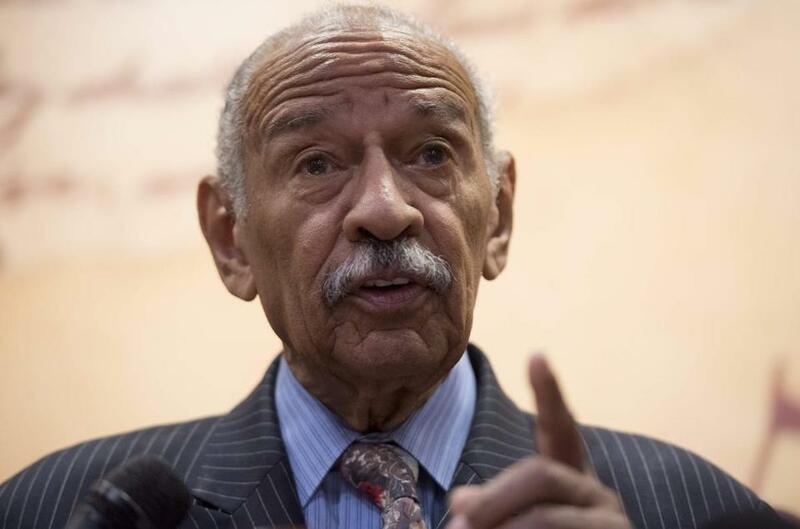 From a hospital in Detroit, the 88-year-old congressman said he is endorsing his son, John Conyers III, to replace him. ‘‘My legacy can’t be compromised or diminished in any way by what we’re going through now. This, too, shall pass. My legacy will continue through my children,’’ Conyers said in an interview with a radio station, Praise 102.7. Conyers left Washington early last week for Detroit, where he was hospitalized for a stress-related illness. His attorney, Arnold Reed, has not provided details of his condition. A defiant Conyers continued to deny allegations that he had behaved inappropriately toward his female staff members. Conyers’s abrupt departure marks the end of a career that spanned the Watergate hearings, impeachment proceedings against President Bill Clinton, the Afghanistan and Iraq wars, and the debate over a national health care system. Conyers influenced debates over each issue as a member and, eventually, the chairman of the powerful House Judiciary Committee. He recently stepped aside as the panel’s ranking Democrat. Described by supporters as an icon of liberal policy making, Conyers was revered on Capitol Hill as a founding member of the Congressional Black Caucus. The group declined last week to call for his resignation, pitting its members against House minority leader Nancy Pelosi, a California Democrat, who said he must leave Congress. Conyers’s legacy was a complicating factor for his caucus colleagues as they weighed how to respond to the misconduct allegations. In 1964, when he won his first term, Conyers was one of just five black members of Congress. He immediately hired Rosa Parks, who served on his staff until her retirement in 1988, and he backed the major planks of President Lyndon B. Johnson’s ‘‘Great Society’’ program, including the Voting Rights Act. In April 1968, four days after the assassination of Martin Luther King Jr., Conyers introduced the first bill proposing a holiday in his honor. Firmly ensconced in his House seat, Conyers remained a reliable left-wing vote. He ran twice for mayor of Detroit, losing both bids in the Democratic primary. He had more success in the House, where he took over the Oversight Committee in 1989. Six years later, he became the top Democrat on Judiciary. In recent years, Conyers lent his name and clout to a series of progressive bills, not least the Expanded and Improved Medicare For All Act. In 2017, a majority of Democrats — for the first time — cosponsored the measure, putting them on the record for universal health care. Representative Raul Grijalva, Democrat from Arizona, a longtime cochairman of the House Progressive Caucus, said that the Conyers-backed left-wing bills — which had no chance of passage in this Congress — would be adopted by other members. Now that Conyers has resigned, Michigan Governor Rick Snyder will call a special election to replace him. State law does not put a timeline on the decision. Ian Conyers, the grandson of Conyers’s brother, plans to run for his seat, setting up an intra-family contest. His candidacy was first reported by The New York Times. Messages left with Ian Conyers seeking further comment were not immediately returned.